WASHINGTON — President Donald Trump’s brief flirtation with Sen. Chuck Schumer and Rep. Nancy Pelosi is over — or at least on a break — and the president has his eyes on a new set of Democrats: Business-minded moderates. But Democrats say it will be hard for Schumer and Pelosi to hold their members in line in the face of a proposal that would slash tax rates for corporate titans and potentially many middle-class families alike, as the president seeks his first major legislative accomplishment. “There is an opening to bring some of those moderate Democrats in,” said Kristen Hawn, a political strategist and former aide to the centrist Blue Dog Coalition in the House. Democratic votes give Trump at least the patina of bipartisanship and they also serve as a cudgel in his negotiations with the GOP. The threat: If Republicans oppose him, he can just sweeten the pot for Democrats and bring more of them on board to get what he needs. The courtship is well under way. Trump invited Indiana Sen. Joe Donnelly, a Democrat facing a tough re-election bid in 2018, to ride aboard Air Force One to an Indianapolis rally touting the tax plan on Wednesday, and he asked several Democratic members of the tax-writing House Ways and Means Committee to the White House to discuss the outline on Tuesday. Donnelly, one of three Senate Democrats who declined to sign a letter to Trump laying out conditions for a bipartisan discussion of tax reform, praised portions of the president’s plan in a statement but stopped short of promising his vote. “I’m pleased the President has been supportive of my proposal to address the outsourcing of American jobs, and I am hopeful that any tax reform proposal includes measures that support American workers as well as the middle class and encourage domestic investments,” he said in a statement. Rewriting the tax code is a tough goal — it’s been 31 years since the last major overhaul — and Trump has his work cut out for him in getting Republicans aligned behind his plan. Some will be wary of the overall price tag, while others may be reluctant to kill certain breaks that benefit allies in the business community or their constituents — for example, lawmakers from New York, California and other states where taxpayers get a deduction for the state and local taxes they pay. Since it would take just three Republican defections to kill a tax bill if Democrats were united in opposition, that’s given some Democrats optimism that they’ll have a chance to help shape legislation that would actually implement Trump’s blueprint. 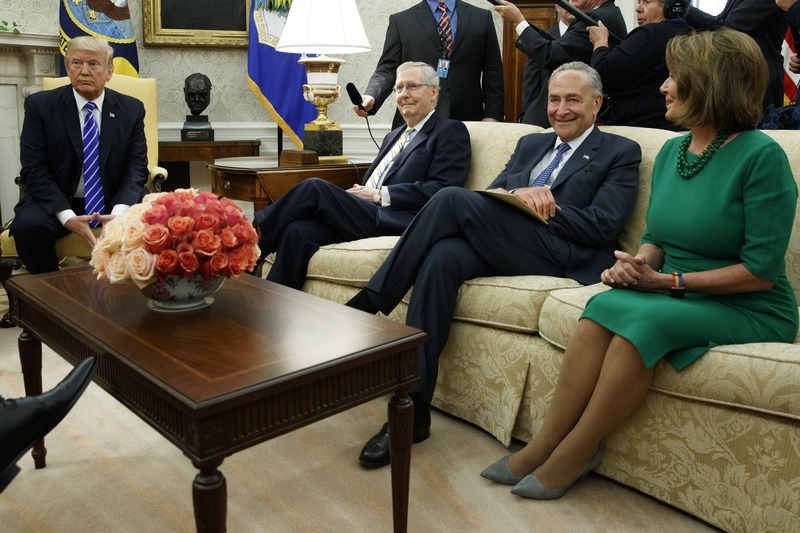 They’ve been encouraged by Trump’s work with Schumer and Pelosi on a bill that kept the government running, raised the debt limit and provided aid for victims of Hurricane Harvey, his frustration with Republican leaders’ inability to pass his agenda, and his willingness to buck GOP orthodoxy in the interest of a deal. After meeting with Trump Tuesday, Rep. Brian Higgins, D-N.Y., concluded that the president wanted to play ball with Democrats on overhauling the tax code. “This is going to be a negotiation,” Higgins told NBC News. “He’ll peel off a few,” Rep. Alcee Hastings, a liberal Florida Democrat, said of Trump’s odds of winning moderate Democratic votes. Of course, the devil’s in the details — and Trump intentionally left many out. For example, he would reduce the number of individual income tax brackets from seven to three —12 percent, 25 percent and 35 percent — but didn’t set the income levels at which each rate would take effect. And even then, the plan leaves room for a fourth bracket between 35 percent and the current top rate of 39.6 percent. “I don’t expect Democrats to say that GOP tax proposals are dead on arrival but i expect a lot of skepticism,” said Jim Kessler, senior vice president for policy at the centrist Democratic think tank Third Way. Trump may be willing to deal to win Democratic votes — or at least show that he’s willing to do so to keep Republicans in line.